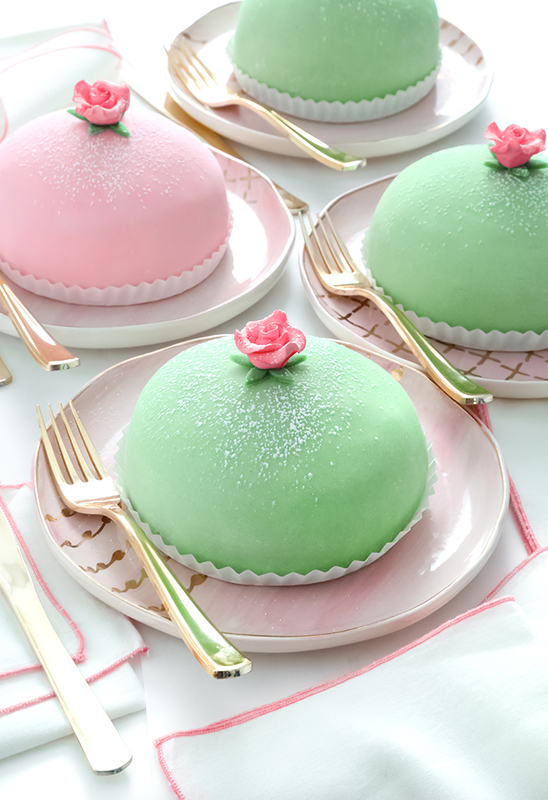 Prinsesstårta has its origins in the 1920's with Jenny Akerstrom, a Swedish home economics guru who was an instructor to the three daughters of Prince Carl, Duke of Vastergotland: the Princesses Margaretha, Martha and Astrid. 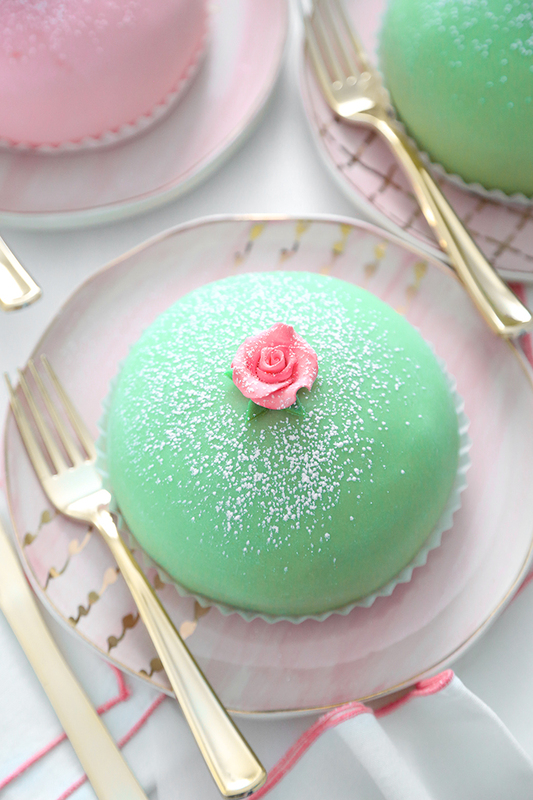 The cake was renamed Princess Cake rather than Gron Tarta or Green Cake because the Princesses loved the cake so much. 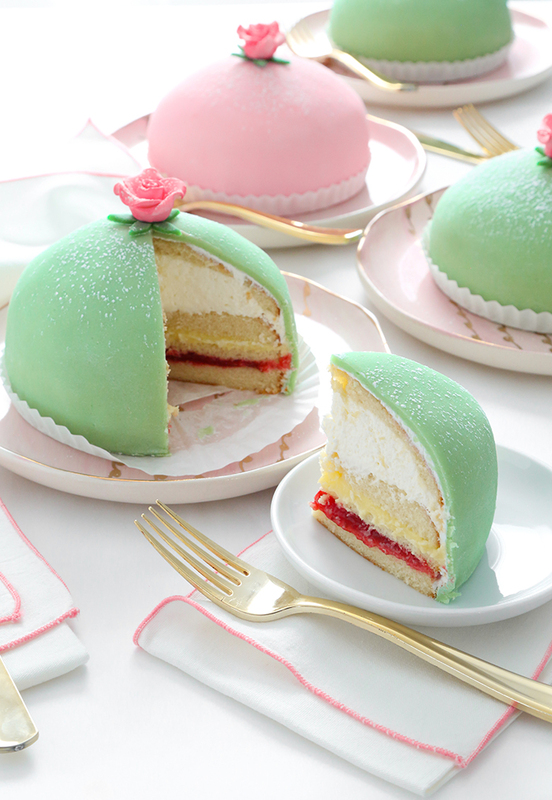 Currently, the cake is baked all over Sweden and is popular for special occasions. Although this recipe has all of the cake's original elements, I built it a little differently to give it a longer shelf life in the refrigerator. My research found most bakers reporting the top dome of whipped cream broke down the marzipan covering quickly, so the cake needed to be eaten the same day it was made. I torted the sponge into 4 layers instead of the usual 3. This provides and extra cake layer that can be placed between the whipped cream and marzipan coating. Speaking of whipped cream, I stabilized it with gelatin so the dome would be sturdy under the weight of the extra cake layer and marzipan. I am nothing if not paranoid of a cake wreck. I made another small addition: A thin layer of buttercream covers the entire cake so the marzipan coating will stand firm and look smooth. Princess Cake purists will probably take issue with this, but the cakes held up extremely well for several days in the refrigerator. This extra insurance gave me plenty of time to deliver the cakes to friends and family. And the interiors remained super fresh and tasty all sealed in with buttercream and marzipan. The pound of marzipan I bought covered three of the 5-inch cakes, so the fourth one received a coating of pink fondant. I have acquired a taste for fondant, but for fondant haters - you'll want to use the best marzipan available. You can make your own, but since this cake already has many steps I recommend purchasing it. 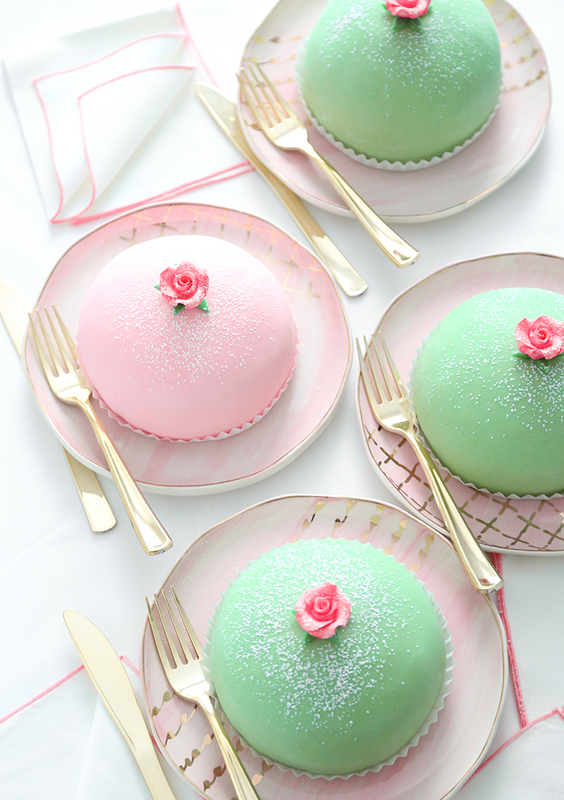 I recently discovered Scott's Cakes marzipan, and it was the perfect sweetness and texture for these cakes. It rolled out as well as any fondant I've used and created a smooth and even exterior. After covering the cakes, there was a small amount of marzipan left over, so I tinted it darker green to make some leaves. I ended up only using the little star shaped leaves for the base of the roses because it looked tidier on the finished cakes, somehow. I received some cute ready-made white candy roses in my stocking for Christmas, so I painted them pink with food color dissolved in clear extract. They were perfect Princess Cake toppers. You can find them here. The recipe provided makes one 9-inch torte. If you'd like to make four little cakes as I did, you'll need to double the recipe and divide the sponge batter between 5 or 6 inch round springform cake pans. All those flavorful components work together beautifully, and the cake has a nice lightness that makes it easy to go back for seconds! The raspberry jam provides a nice counter to all the creamy elements, and the marzipan coating lends a bright almond note. It is just my style, and I look forward to making it many times over! This recipe is an amalgam of research from Daring Bakers, Semi Swede, Martha Stewart, with my own pastry elements. Preheat the oven to 350°F. Grease and line a 9-inch round springform pan with parchment paper. Make the sponge: Place the eggs and sugar in a mixing bowl and beat on high speed until pale and thickened. Properly whipped batter should be light and thick, and fall in a ribbon back into the bowl leaving trails of batter on the surface. In a separate bowl, whisk the flours (or cornstarch), baking powder and salt together. Carefully fold the dry mixture into the egg mixture until thoroughly combined. Pour the batter into the prepared pan and bake for about 40 minutes or until a toothpick tester comes out clean. Let the cake cool slightly in the pan for a few minutes then run a knife around the edge and remove the springform collar. Peel away the parchment and let cool completely on a wire rack. Make the custard filling: Stir together the cream, egg yolks, cornstarch, and sugar in a small saucepan. Cook over medium heat, whisking constantly, until the mixture thickens. Stir in the vanilla and remove from heat. Transfer to a bowl and let cool slightly. Press plastic wrap over the surface of the custard and refrigerate until firm. The chilled custard should be thick and hold in the bowl of a spoon. Make the stabilized whipped cream: Sprinkle the gelatin over the 2 tablespoons of water in a small bowl. Let stand until set. Place the heavy cream in the bowl of an electric mixer fitted with a whip attachment. Set mixer speed to medium and beat until soft peaks form. Heat gelatin in the microwave for 5-7 seconds, or until completely liquid. Gradually add liquid gelatin to whipped cream in a thin stream with the mixer running. After all of the gelatin is added, increase mixer speed to high and beat to stiff peaks. Set aside. Build the layers: Torte the cake into four layers using a serrated knife or cake leveler. The layers will be very thin so do this carefully. Place the bottom cake layer on a plate or cake board. Spread on the raspberry jam and top with a second cake piece. Top the second cake piece with the custard filling (you may have extra custard). Top with a third cake layer. 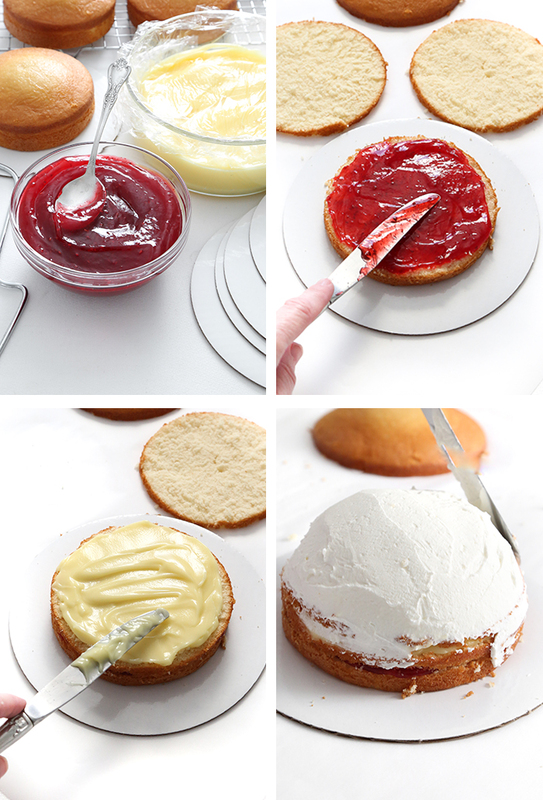 Pile all of the whipped cream on top and smooth into a dome shape using a large spatula. 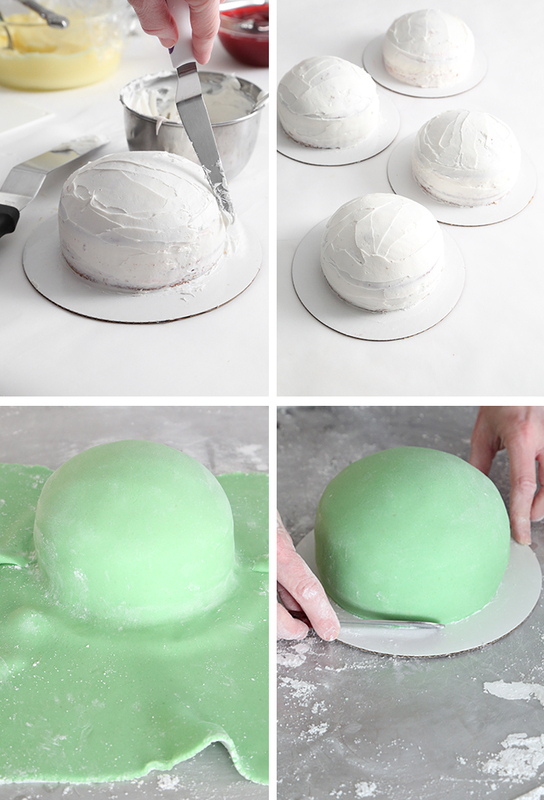 Place the final cake layer on top and press down so that all of the cake’s edges are smoothed against the whipped cream and a dome shape is formed. Cover the entire cake with a thin layer of buttercream, smoothing it as much as possible. Refrigerate until the frosting is firm, about 40 minutes. Prep and cover with marzipan: Dust a work surface with marzipan. Knead the marzipan with your hands to soften and place it on the work surface. Add a small amount of leaf green food color to the marzipan and knead in until a consistent green color is achieved. Lightly add powdered sugar as needed to prevent sticking. Roll it to a large circle, lifting to occasionally dust underneath with powdered sugar to prevent sticking. Gently lay the marzipan circle over the top of the cake and use your hands to form the marzipan to the shape of the cake. Trim the excess marzipan from the bottom of the cake using a pizza or pastry wheel. Gently tuck the bottom edges of the marzipan under the cake using the back of a butter knife. Decors: Paint the white Wilton candy roses with a little Baker’s Rose food color dissolved in clear extract. Use a kitchen-dedicated art brush with soft bristles so the food color can easily be brushed between the petals. Tint leftover marzipan with a little more leaf green food color, and roll flat on a powdered sugar-dusted work surface. 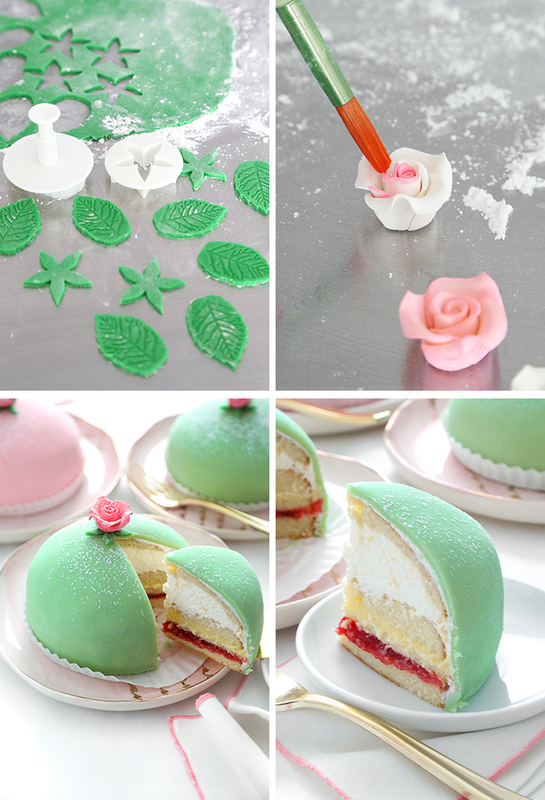 Cut small star-shaped flowers from the marzipan using a fondant cutter. Use leftover buttercream or a dot of corn syrup to attach the star shape to the bottom of the candy rose. Attach the rose to the top center of the cake using buttercream or a dot of corn syrup. Dust the top of the cake with powdered sugar using a small sieve. The cake needs to be refrigerated until serving time and any leftovers need to be refrigerated as well. These are so beautiful! This cake has been on my baking list for a very long time too! Ooh!! HI from a swedish follower - I was super excided when I saw this post and it really put a smile on my face! 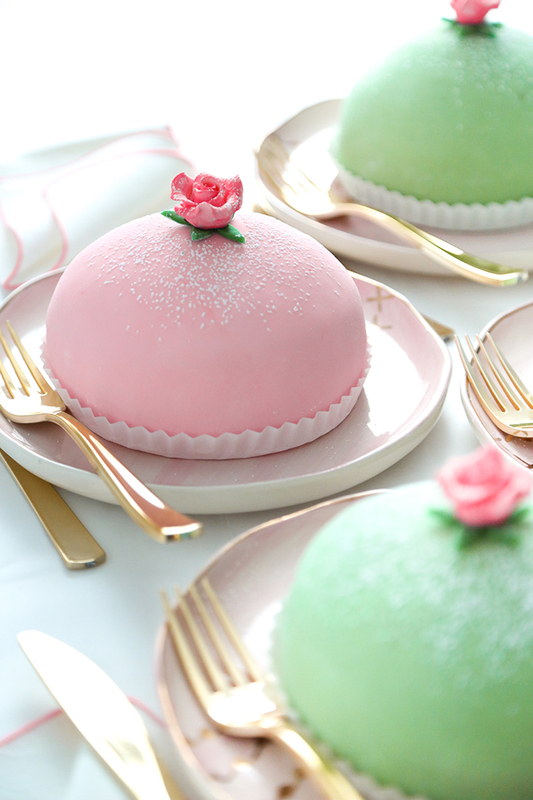 :-) Your version of the most traditional swedish cake and a given part of our ”fika” is brilliant! Very good job and I actually like the buttercream idea, something I will try the next time I’m making these. This makes me very happy. It has been on my bucket list for some time too. So much so that today I learned of a new bakery in Chicago that makes swedish things and had planned to take the trek tomorrow, in the below zero forcast just to get one. I have looked at recipes and didn't seem that terrible but there is a difference in just reading a recipe and having visual pictures to help in the assembly so I think you saved me not only the cost of the cake but also the price of gas, and the cost of an L ticket, not to mention saving me from frost bite as I'd have to walk from the train to the bakery. I so wish I was your neighbor! I am having difficulty understanding how you got the top layer of cake over the whipped cream and maintained the dome shape They look so delicious I also have read about this cake but have never made one Thanks for the beautiful encouragement! Hi Roger. The top cake layer is a very thin layer of sponge, so when you place it over the whipped cream, it molds down easily around the dome. Then you can smooth it more with the thin layer of buttercream. I hope this helps!